If you are interested in how changing your diet and lifestyle can help with health issues and sometimes even reverse a serious disease like Type 2 diabetes then you must watch Dr. in the House BBC1 9pm.There are three episodes and the first one was last week but you will be able to get it on catch up. Here is an interview with Dr. Rangan Chatterjee’s from last Thursdays BBC breakfast television to give you a taster. I was so heartened by Dr. Rangan Chatterjee’s approach to health care as it is so in line with the holistic approach that I take as a Nutritional Therapist. In episode 1. Dr.Rangan spent time with a family assessing their diet, lifestyle and looking for underlying causes of their health problems. The dad had type 2 diabetes poorly controlled with the use of 3 drugs, Mum had menopausal symptoms, stress, and sleeplessness. With the help of Dr. Rangan Chatterjee’s within two months the family had all lost weight, the dad was able to reduce his medication from three drugs down to just one and the Mum had her stress under control, was sleeping better, had reduced severity of night sweats and all without taking HRT. Typically when we go to see the doctor we have a 5 to 10 minute appointment where it is impossible to take such a holistic approach to health, and more often than not we end up with a prescription for a drug which treats symptoms and not the real underlying cause of the health problem. This may seem to be the cheapest quickest solution but is it really in the long run? Taking diabetes as a case in point, did you know that the cost to the UK of type 2 diabetes treatment is £25,000 a minute or £1.5m an hour? Just think if 50% of type 2 diabetes patients could be reversed and 50% prevented what the government might do with those funds… Dr Chatterjee shows how to reverse and better manage type 2 diabetes in just a few short weeks. In turn think what all those people might do with their better health and greater energy! 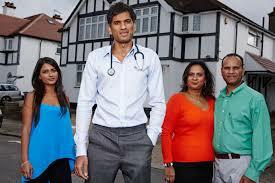 When I dug deeper I discovered that Dr. Rangan Chatterjee’s had actually consulted closely with Michael Ash a Nutritional Therapist in relation to dealing with the cases for this series. As Nutritional Therapist we have been dealing with health issues in this way for years and its works! Please see my diabetes page for information relating to reversing Type 2 Diabetes.